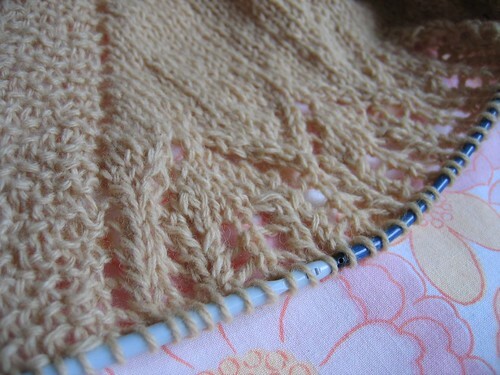 I’m at that bit where all I want to do is knit… because it is very *nearly* done. Well knitting the ripped section back up didn’t seem to take that long actually, and by the time I got to the Bluestockings meeting on Wednesday I was pretty much ahead of the game. And by the time I got *home* from the Bluestockings meeting, (after a quick bit of dirty maths) it turned out to be time to start the edging. 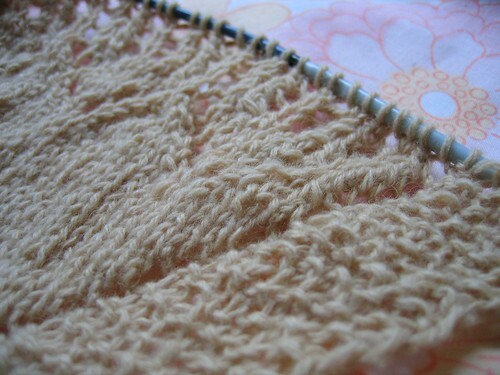 Actually it might turn out that I should have started the edging about 4 rows earlier, but there is a wiggle room so i’m not going to panic too much. This is where I’m deviating from the pattern (well that and making it longer). So it’s 24 (or probably 22) rows of edging and then 8 rows of moss-stitch (at which point I lose the will to live…) and then I get to block and see what I’ve got. Please note that W has decided it’s a cape. And that he’s a little jealous that I have knitted myself a cape, and not made him one.